Another lovely idea I got from APFK and just modified a bit. 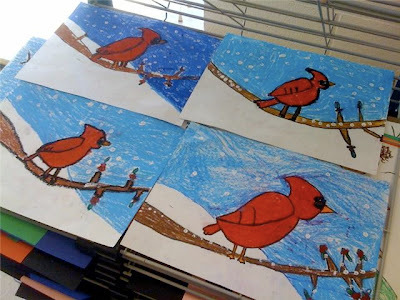 We used 9x12 white paper, did a step-by-step of the cardinal after discussing them and looking at books--then the kids outlined, and used oil pastel to color. They went back and re-outlined with a black oil pastel to make it bold again. They added snow at the end using q-tips and white tempera paint. these are so beautiful! i love the colors! I love it so much.. They're so beautiful..
Hi! 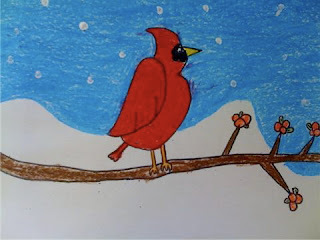 Just wanted to let you know that I really enjoy reading your blog and the great ideas and art projects you share!